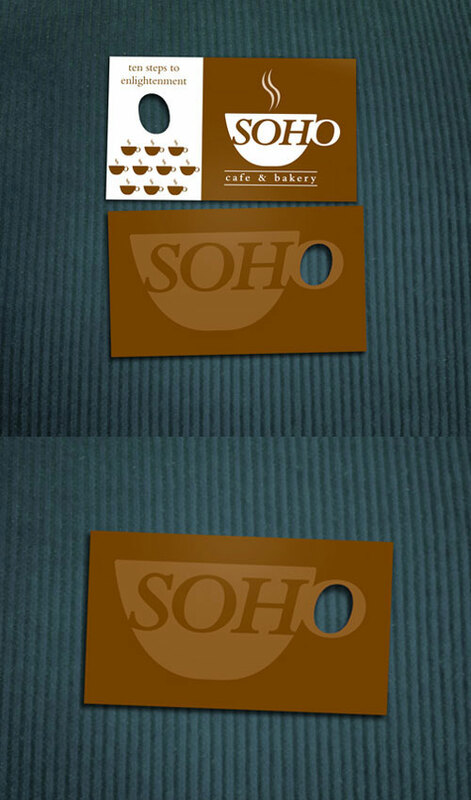 After designing the SOHO bakery & cafe logo, the owner asked me to create a business card utilizing the new logo and color scheme. Though she didn’t have the money at the time, I decided to create a punch card (with a die indicated) and asked the printer to fill any open space on the paper with the the art in hopes that in time the owner would have the money to pay for the die. Sometimes things just work out. Since positive and negative space plays such an important roll in the SOHO logo, it only seemed natural to use a die to bring the visual “play” to a tactile element.